I was chatting to a friend earlier, and the subject came up in conversation of how the internet is a fairly level playing field. After all, a lot of the time, you aren’t even sure who the person you’re talking to is, and even then only if you check. This put me in mind of something I’ve been thinking about quite a lot recently: Internet pseudonyms. I refer you to an article by the mighty Sci Curious written for Science of Blogging about whether to be a pseudonymous blogger. I’ve been going by the moniker “Invader Xan” for a few years now. It’s an evolution from internet usernames I’d had previously in other places.★ A few years after I started using this name was around the time I started writing Supernova Condensate, and it’s now the name you’ll find me under on most parts of the internet. That said, I’m not particularly fastidious about cleaning up my tracks. If you’ve been reading Supernova Condensate for any length of time, you almost certainly know by now where I live, what I do, and probably my real name. Indeed, it’s come as a surprise on occasions when people have mentioned to me that they enjoy reading my blog. Not an unpleasant surprise, but a notable reminder that my online persona isn’t exactly detached from who I really am. Being politely requested to make sure I watch who and what I write about on here is the precise reason for the disclaimer you’ll see on my info page. Sci’s article is interesting, not just for what she’s written, but also for the comments. Several people caution that a psudonym is limited protection only. You need to be incredibly serious about it if you want to wear a full mask. And even then, believe me, I’ve been hooked into this digital world long enough to know that if you want to find something out, you can. You just need to know where to look. It’s already been seen that us bloggers need to watch what we write. Our anonymity is not secure by any means, and legal action has already been taken in more than one case, to reveal a blogger’s true identity. Anyone who’s paid attention to the science blogosphere over the past few years will know well, the story of Simon Singh — the man who was audacious enough to call out some bullsh*t, and finally ended up being the cause of UK libel laws being rewritten. Of course, I don’t think I write anything particularly libellous (do I…?). But then, it’s always worth considering those I write about. I’m happy to be held accountable for anything I write about here. Really, I think the overall tone on Supernova Condensate is a positive one. You’re unlikely to ever read me outright slamming something unless I have a damn good reason to do so. In any case. I don’t worry about hiding my identity per se. Lots of people know who writes this blog, including my supervisor, my office mates past and present, various friends and colleagues (and now, I suppose, anyone who finds me on Linkedin too). The quick check is that if you were to Google my name? Like, my name name — the one on my passport, which I actually publish science under? You won’t find Supernova Condensate, and you won’t find Invader Xan. In short, if you’re looking for me, you’ve unlikely to find this blog unless you already know to look for it. Or unless you’re one of various friends of mine in the real world who already know about it. I’m content to wear half a mask. I need no more. ★ For anyone who doesn’t realise, the name is also a play on the title of a certain slightly macabre cartoon by Jhonen Vasquez. The top image, incidentally, refers to a reasonably famous piece of internet culture — A cartoon by Peter Steiner drawn in 1993 entitled “On the internet, nobody knows you’re a dog.” Little nerd history lesson for you there. The original cat picture is from nekoyanagi’s photostream. 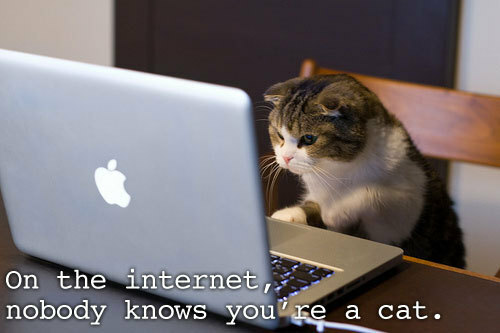 This entry was posted in academia, Imported from Livejournal, life and tagged blogging, cats. Bookmark the permalink.